Kolkata - 700 059, West Bengal, India. Dr. Dhar was awarded the Ph.D. Degree by the Gauhati University in 1983 on his thesis "Impact of Immigration in Assam, 1871 - 1951". He began his career under the Provident Fund Scheme. Then he worked as a Health Educator under the Ministry of Health and Family Welfare, Government of India and as a Field Reporter, All India Radio, Shillong. He had intensive training and vast experiences in Mass Communication, Editing and Administrative Training in various Government Institutions in the country. Dr. Dhar retired in 1996 as a Regional Director in the Department of Economic Affairs, Ministry of Finance, Government of India. The author attended various regional and national Seminars and Conferences. A good number of his articles in English and Bengali was published in reputed newspapers and periodicals. 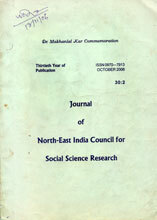 He is the founder life member of North East India Council for Social Science Research Shillong. He is also Life – member of Srihatta, Sanmelani, Kalindi Bhawan, Calcutta – 28, and also life-member of Biswa Banga Sahitya – O-Sammelan, Kolkata. He is founder of “Nripen’s Rendez - vous” (A library forum) since 1999.His articles appeared in the English daily The Assam Tribune (Gowahati), The Indian Express (Ahmedabad), Bartaman (Kolkata), Aajkaal (Kolkata), The Telegraph (Kolkata), Cha Shilpa Sramik Union, Guwahati, Asom. O Assom - Oh Asom - Alas The Brahmaputra Valley (In English). He has a lots of performance and production in different areas of North-Eastern Region of India.